Are you getting bored with your regular fragrances? Give your personality something striking with international fragrances available in miniature forms. Over a period of time, people in the country have been indulging more and more in the luxury however, they still shy away from the cost spent on something luxurious. Keeping their needs in mind, perfume brands all around the world started coming with small versions of their fragrances, keeping the cost in the budget as well as giving the fragrance lovers a sense of pride in using world class fragrances. Even though they are so budget friendly, all these miniature perfumes lacked several important features. Scent Shot launched by Perfume Booth is one brand that has taken into consideration all these pointers giving the perfume lovers something truly revolutionary and unbelievable. What makes it better than others? With Scent shot, you can get many perfumes in one pack. Every pack contains 7 international fragrances so that you can use a different fragrance every single day. Each fragrance comes from a different brand giving you a freehand upon choices. The brand has created 3 packs for men and women, giving 3 variations to each. Every pack is targeted on a particular personality hence you can choose fragrances suitable to your personality and cherish it all day long. Unlike other miniature perfumes, Scent Shot is available in a decent quantity of 35ml, which can last for the entire month. For someone who has a tight budget for perfumes, this quantity allows him or her to enjoy the fragrance for entire month, unlike regular deodorants or tester packs. The fragrances filled inside are of high quality, therefore, they last for more than 4 hours. If you will use it optimally, this is a good investment for you. This is what makes the Scent shot stand apart from the rest of the brand. Since you have a busy lifestyle and it is not easy for one to carry perfumes and deodorants everywhere they go, scent shot vials come with a carry friendly case. 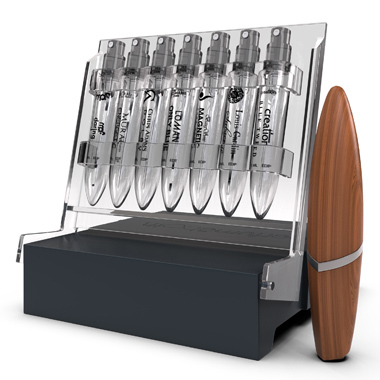 You can simply slip in the vial into this case and close the cap. It is ready to be carried around. You can keep it in your pocket, handbag, clutch or even your jeans. Giving the perfume users something extra, every pack of Scent shot comes with discount vouchers worth Rs. 801. This can be used to buy perfumes you just tried in the pack with flat discounts also get discount on the refill packs. If you like any perfume, you can buy it or try another variant with the refill. This is a perfect option for travellers who are always on the run due to adventure or business. They can keep the miniature perfume case in their bags and carry case in their pockets using it whenever they feel the need. It can be taken on the flights as well without worrying about anything. Get your fragrance miniature pack now and enjoy this new age of perfumes from top international brands.